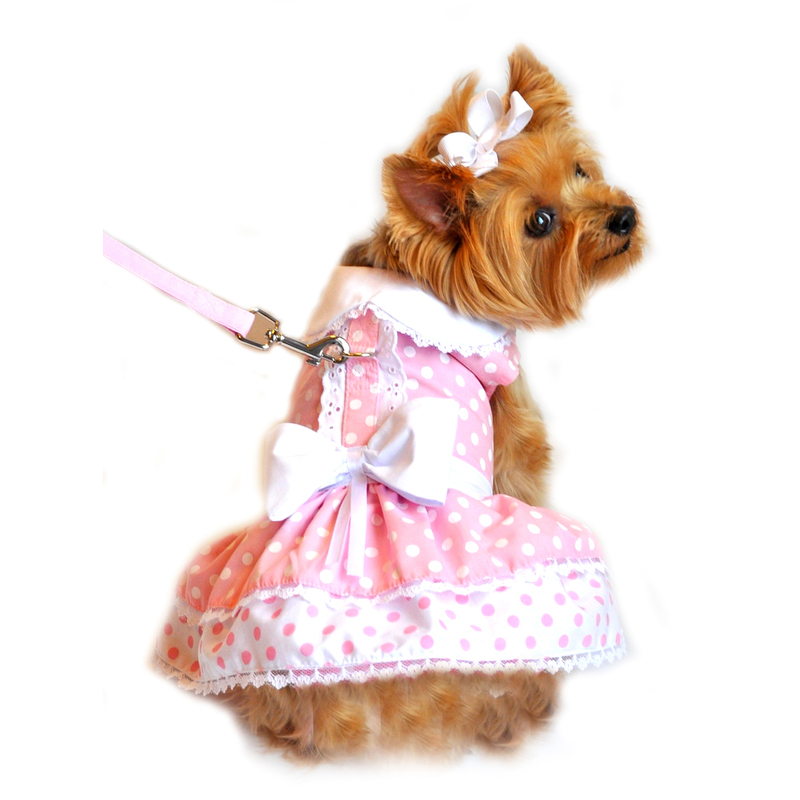 Pink Polka Dot and Lace Designer Dog Harness Dress by Doggie Design Customer Photos - Send us your photo! Princess is 14 years old and she loves to wear her pretty dress she looks like a ballerina dancer! Lola and Ruby met on a shorkie site and when we were traveling from VA to NY, we all decided it was time for these two little shorkies and long distance friends to meet! They decided they just had to wear their matching Pink Polka Dot and Lace Dog Harness dress for this very special occasion. They are both BaxterBoo girls and have lots of BB outfits! Hmm..wonder what they will wear for their next meeting! I know it definitely will be something from BaxterBoo! Our precious Zoye Joy all dressed up for Easter. Miss Molly loves to wear dresses! We better have one ready to put on her when we take one off for cleaning or she will have a fit! She is wearing size Large in this beautiful Doggie Design dress! Chloe waiting for the Easter Bunny. Molly Bea wore her pink polka dot dress to our local Humane Society Easter egg hunt for dogs and won best dress in the small breed group. She is a miniature American Eskimo/ spaniel mix. Loves a camera.. Mia is also a service animal. Not a per , but a valuable member of our family. She is 4yrs old. I bought this dress for Buffy to wear to mine and my husbands 40th Anniversary party. She was definitely a hit. She is about 8 lbs and spoiled. She is definitely Momma's girl. Rosie is feeling pretty and Oh so girlie in her little pink polka dot dress. Molly is 4 months old and looking pretty!! My little baby is very spoiled, she has me very well trained. When he chews on a bone I have to hold it. When she wants to eat we have to be in the same room. When we go out for a ride she gets so excited and jumps at the table where her clothes and leashes are are kept in the kitchen she can wait. When we go see Grandma she gives me kisses and cries until we get going! She is my little princess!! Love this adorable pink polka dot dress! One of Ava's favorites. Too cute. Chloe loves to be dressed up in her little dresses. She's the best dressed Pom around! This is my new Easter Dress???? My boyfriends, who are dachshunds and live next door to me, are going to have our picture made with the Easter Bunny. They love my dress and think I am so pretty in it???? Did anyone said Pink????? Oh I love it.....says Niki. Thanks again to Baxterboo for their fashions. I'm the Top Model" in the neighborhood.....says Niki. Here comes Nicky enjoying her beautiful dress and leash. It's very cool for spring and fits perfect. She's ready for her walk at the Park today. Molly's new dress coordinates with her stroller! Perfect for an evening beach walk! Molly wants to go out and show her playmates her new dress! Molly loves her new dress! Abby and Maggie playing with their balls in their Easter dresses. They know how pretty they look! They even posed for the camera. My little loves to get all dressed up for spring. She's always so happy to show off all her beautiful clothes from Baxter Boo. Each season the neighbors wait to see what she'll be wearing next! Posted On 04/09/19 by Cindy H from Terre Haute, IN Yes, Cindy H recommends this product! 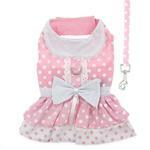 this cute pink & white polka dot Doggie Design Dress Harness is adorable. Size Large fits my 20lb Cavalier King Charles Spaniel perfectly! Posted On 04/07/19 by Kelly S from Lancaster , OH Yes, Kelly S recommends this product! This Pink & White Polka Dot Dress Harness is absolutely adorable! I got a medium for my little girl. She has a 16.5” chest and it fits great. This was her Birthday dress and everyone just loved it and made a fuss. If u order this, you definitely won’t be disappointed. This pink polka dot harness dress is too much! My little girl is a 10.5 lb Shih Tzu that has a 16” chest and the medium fits great. Her Birthday is coming up at the end of the month and this is her Birthday dress! Oh boy! She’ll be so Pretty in Pink Polka Dots! Ma-Ma can’t wait!! Posted On 02/07/19 by Vicki V from Vestavia , AL Yes, Vicki V recommends this product! Adorable Pink Poka Dot Lace Harness Dress and good quality. Very stylish yet easy to put on. Love the D-ring on the back - harness dress. Fits and made well. This dress is so precious on my little girl. I plan on using it for Easter. I love that I can take her walking in it. I love the matching leash. The price is so amazing. I love shopping Baxter Boo. They have GREAT deals. Posted On 09/18/18 by Sharon Hines from Shawnee Hills, OH Yes, Sharon Hines recommends this product! Purchased this precious little dress for my very feminine, little (puppy mill rescue) Maltese, Bella. I LOVE IT! I am a fan of polka dots anyway. Bella, who is very tolerant of my dressing her up, looks like the precious little princess girl that she is! The fit is great. I love the Velcro, which allows for adjusting to fit her perfectly. The matching leash is the icing on this cake. I washed it, upon receipt, to rid it of the new smell. It washed beautifully (hand washed in cold water). I allowed it to line dry, shaping it out by hand. It is absolutely adorable. I love the quality of Baxter Boo products. We're going to a special pet event soon, and Bella will shine in her new dress! Posted On 07/08/18 by Michelle W from , NC Yes, Michelle W recommends this product! I just love the dresses and matching leash outfits. I really like the velcro closures that allow to loosen and tighten as needed. I will definitely be purchasing future items. Posted On 05/11/18 by Karen A from Fairfield, OH Yes, Karen A recommends this product! I absolutely love this dainty pink harness dress on my little Yorkie, Zoye. She looks SO adorable wearing it! Very well made. This dress is absolutely adorable. I ordered size Large for my Cavalier King Charles Spaniel, and it fits her perfectly! Love the matching Leash! Posted On 03/28/18 by Kathy R from , Yes, Kathy R recommends this product! Annabelle wore this dress for her birthday in January. She loves getting dressed up so I let her wear it to training. Her trainer loved the way she pranced around. I am really sold on this brand! Posted On 01/29/18 by Kathy R from , Yes, Kathy R recommends this product! I bought this dress for my 3/4 Poodle/ 1/4 Maltese mix. I have bought other Doggie Designs in the past & have found that they fit her best. I love the designs & fit & would recommend this dress to others. Posted On 07/24/17 by Belinda Woltmann from Collinsville, IL Yes, Belinda Woltmann recommends this product! Very well made and true to fit. Cute as can be! I have two of these, my girls look so cute when they are dressed as twins! Sissy and Missy of course they had to have the same harness dress!! Love, love this dress on Pixie! I bought an XS because she is suppose to weigh five pounds or less as an adult. It fits great now at 2 1/2 lbs., and its adjustable so she will be able to wear it for years. Thanks Baxter Boo!! Posted On 06/12/17 by Elaine M from Idaho Falls, ID Yes, Elaine M recommends this product! The Pink Polka Dot and Lace Designer Harness dress arrived prior to scheduled delivery and in perfect condition. The Velcro tabs at both the neckline and at the belly ensures a great fit every time. Machine washable just adds to the ease of this dress! I could barely get this dress on as Judi, my Maltapoo was shaking in eagerness to get it on. So cute and looks so great against her mostly white smile. This one is a winner for sure! Posted On 06/08/17 by Kimberly A from Parkville, MD Yes, Kimberly A recommends this product! This is such a cute dress! There is such a nice collection of outfits to pick from! Ellie gets compliments wherever we go when she is wearing her dress. Posted On 05/23/17 by Ronald L from delray beach, FL Yes, Ronald L recommends this product! I had ordered some dresses from another site but they only had one that was also a harness - BaxterBoo had a great selection (I bought 5 of them) and they are all well made. They even came with matching leashes and cute little coat hangers. The prices were great as well. A very satisfied customer. And my two cuties get to be even more cute. Posted On 05/14/17 by Anna A from Snohomish , WA Yes, Anna A recommends this product! Posted On 05/08/17 by Lynn S from Maplewood, MN Yes, Lynn S recommends this product! I bought my little Pom, Chloe, this dress cpI of years ago. I liked it so much I bought this for my sons little toy chihuahua. Can't say enough about this dress. It's very fashionable. Posted On 05/07/17 by Kelly D from Des Moines, WA Yes, Kelly D recommends this product! Two in one, everyone at the vet's office fell in love with the harness dress - wanted to know where I got it! Posted On 05/05/17 by Diana R from Katy, TX Yes, Diana R recommends this product! The dress is made well, fits perfect and Jazz looks adorable price is well worth it. Love my new polka dot dress. Especially since the leash is attached. I love the dress with the leash, so convenient. Posted On 04/16/17 by Michelle C from Loganville, GA Yes, Michelle C recommends this product! Posted On 04/10/17 by Katherine R from Sacramento , CA Yes, Katherine R recommends this product! I ordered a small and a medium for my cats. The neck was too big, but the rest fits. Posted On 04/10/17 by Patrick O from Crown City, OH Yes, Patrick O recommends this product! This is the second dog harness that we have bought but it will not be the last! They are very well made and fit Trixie Mae, like a glove. She is happy wearing this harness because it doesn't pull on her neck. This harness has velcro around the neck and chest, so you can get it as tight or loose as needed. Great product! Posted On 04/03/17 by Tammy C from Raleigh, NC Yes, Tammy C recommends this product! Dress is very cute, and fits well. Very nice to be able to use as a harness with the matching leash. This was much cuter than the picture showed and we loved it. It is well made and absolutely the most adorable little outfit for Angel Baby. Very cute with matching lease. Fits nice. Posted On 03/30/17 by Theo B from NPR, FL Yes, Theo B recommends this product! It is so pretty in the pictures, even better in real life. My Molly looks so sweet in. Great quality. Posted On 03/22/17 by Marilyn K from Lee's Summit, MO Yes, Marilyn K recommends this product! My Bella loves wearing any of Baxter Boo's outfits. This pink dress with matching leash is so adorable. Many people have stopped us on our walks to say how pretty she looks. It has a great fit. Super easy to put on and off. I love the bow and ruffle. So elegant!! Posted On 03/13/17 by Sharon A from The Villages, FL Yes, Sharon A recommends this product! Just received my dog harnesses that I ordered and this one is absolutely darling---even cuter than online. It fits Oreo perfectly. Posted On 03/13/17 by susan h from ft laud., FL Yes, susan h recommends this product! My little princess does not want to walk in the dress. Iam not sure if it hits her funny or the wide velcro at waist. It is too cute! She will wear it somewhere. Posted On 03/12/17 by Paulette K from Amarillo, TX Yes, Paulette K recommends this product! Hiedi looks so adorable in her pink polka dot and lace designer dress. She has told everyone at the dog park that BaxterBoo clothes are the way to go. So sweet, love the ease of the velcro. This is ADORABLE!! Everybody I showed LOVED it!! The most common reaction was that it was nice enough for a real baby to wear!! Posted On 03/05/17 by Brenda from Thomasville, GA Yes, Brenda recommends this product! Beautiful harness dress, very well made. Posted On 02/27/17 by Fernanda S from Austin, TX Yes, Fernanda S recommends this product! I think this is the prettiest harness dress. I put the dress on my Sophie and she looks so cute. Posted On 02/17/17 by Cathy F from Katy, TX Yes, Cathy F recommends this product! Dress is beautiful. Very good quality. The shipment was perfect. Posted On 01/07/17 by Sherrill N from Tulsa, OK Yes, Sherrill N recommends this product! The Poodle dress and the Hawaiian dress are equally as cute as the Pink Polka Dot and Lace Designer Dress. All the apparel I receive from Baxter Boo is top quality merchandise. I would give them all a 5+ or greater if I could. Highly recommend all three dresses. This little dress is adorable and the matching harness is such a nice assessory. I would recommend this dress to everyone. I would rate this dress a 5+. Lots of positive comments on the dress. Posted On 12/10/16 by Julie N from , NV Yes, Julie N recommends this product! I love this dainty soft pink dress! It was a great price & came with a matching leash!!! What a bonus!! Try this one!! You will be happy you did!! Purchased this for a friends dog who loved it! My yorkie will look adorable in this! Posted On 09/28/16 by tress E from Fort Mill, SC Yes, tress E recommends this product! Love this dress. This is the second set I have bought and my "girls" love them!!!! As do I!! Good quality and easy to wash.
My fur baby looks so cute in this outfit. We are attending an outdoor wedding and my little baby will be dressed in style. The dress is well made and a perfect fit. The matching leash is made of the same material. I was fortunate to get this item on sale, too. Posted On 07/19/16 by Sandee L from Bullhead City, AZ Yes, Sandee L recommends this product! Posted On 06/25/16 by chris m from , Yes, chris m recommends this product! This lightweight dress with the D hook makes getting dressed and ready for the day's activities easy. Our Pomeranian is pretty in pink too. Posted On 04/23/16 by Kimberly A from Baltimore, MD Yes, Kimberly A recommends this product! I love the dress! Ellie looks so cute in it! The measurements were true to the size chart. I measured 14" for her length and ordered a large for her. It fits Ellie just fine. The dress is well made and the material is going to be perfect for the upcoming warm weather. I love the matching leash and that the attachment for it is on the back. Can't wait to order more! This dress is very cute, although the material is economical and not higher end of what I am used to from BaxterBoo. Perfect if you want economical instead of quality. Posted On 04/04/16 by sandy s from iowa city, IA Yes, sandy s recommends this product! Posted On 04/04/16 by Mary S from Thousand Oaks , CA Yes, Mary S recommends this product! I like this dress so much and it's just so "Spring" that when Suki outgrew the small she just had to have the next size up! Every little girl should have a Spring dress!!! Posted On 03/16/16 by Margie E M from O, IL Yes, Margie E M recommends this product! Posted On 03/10/16 by Mary L from THOMASVILLE, PA Yes, Mary L recommends this product! This dress fits my Westie wonderfully and she looks absolutely adorable in it. Love the fact that there is a matching leash with this. I will continue to purchase from here. Posted On 02/26/16 by Rosemary J from Evansville, IN Yes, Rosemary J recommends this product! This dress is absolutely adorable. It is the finest of quality. It runs very true to size. Rose is going to be so pretty in her Easter Dress. Posted On 02/24/16 by Jane D from El Cajon, CA Yes, Jane D recommends this product! Posted On 02/19/16 by Nancy Powell from Barton, NY Yes, Nancy Powell recommends this product! I love love love this dress. It is so soft and pretty looking. It looks super cute on Biscuit. A few friends have seen her in this dress and love it also. When you have a cute dog to begin with and put an adorable outfit on her, it just makes her even cuter!! A matching leash is just an added bonus. Posted On 02/17/16 by Donna from , TX Yes, Donna recommends this product! Posted On 06/08/15 by Denise F from Elmore, OH Yes, Denise F recommends this product! My Chihuahua loved this dress before I could get it out of the package. She strutted around the neighborhood while she wore it on her walk. Posted On 06/08/15 by connie b from waynesbor, VA Yes, connie b recommends this product! very cute!! my little 5 pound poodle mix rescue rue elizabeth was most impressed! she did not want to take it off,and the matching leash that just adds to the beauty of this quality made dress. Posted On 06/03/15 by Terri J from Beaumont, TX Yes, Terri J recommends this product! I just recommended this dress to a friend! I looked all over for this dress and was so glad to see Baxterboo and Doggie Design bring it back! This style is hard to beat. It is super sweet and girly. You'll definitely want to add this to your baby's wardrobe! Highly recommend!!! Posted On 06/03/15 by Charlene S from Crest Hill, IL Yes, Charlene S recommends this product! I love this dress! Absolutely beautiful! Happy they had it in the smaller size in stock. Posted On 06/01/15 by Tristan W from , Yes, Tristan W recommends this product! Our baby loves this dress! Very handy that it comes with a D ring to attach a leash. Very cute and dainty harness dress. I think it is very well constructed and the matching leash is sturdy. The pink is a little lighter in color than the picture depicts, but still very pretty. Posted On 05/20/15 by Julie N from Spanish Springs, NV Yes, Julie N recommends this product! This cute dress fits our fur baby Rylee perfectly! It is such a great deal with the matching leash!! It fits perfectly! And what a great deal with the matching leash! Baxter Boo is the only online shop I ever need to shop!! Posted On 05/19/15 by Katherine M from Boca Raton, FL Yes, Katherine M recommends this product! Molly loves her new dress! It is a very soft pink and the fit is perfect! The matching leash is a great accessory! This is by far my favorite dress! Posted On 05/16/15 by Jan M from Huntington Beach, CA Yes, Jan M recommends this product! No matter what dress I order from BaxterBoo, my little Panda looks adorable. Since she is a black and white long coat Chihuhua, the pink and white dress is so very cute on her. It fits her perfectly. Posted On 05/15/15 by Antonia from Silver City, NM Yes, Antonia recommends this product! Posted On 05/11/15 by Lisa K from West Orange, NJ Yes, Lisa K recommends this product! This dress looks so great on my pup. I absolutely love the look and the utility of the outfit. Posted On 05/10/15 by Lynne O from Springer , NM Yes, Lynne O recommends this product! Dixie Mae is certainly enjoying the ohs and ahs she is receiving when she is stepping out in this cute dress. Very cute. Got lots of compliments. If you want your girl to look extra feminine then this is a great dress. Love the dress. Great Quality. Be careful of sizing. I ordered a small, but needed a medium. My dog is about 11 pounds. Posted On 03/22/15 by Karen F from Eden prairie, MN Yes, Karen F recommends this product! Darling dress. I washed it on delicate and hung it up. Came out perfect. Like new. Love it. Loved the winning Broncos Super Bowl Jersey!